Blending Medium is a liquid used to slow the drying rate of water colours allowing more time for blending. It is particularly useful in hot climates where artists would like their water colours to stay open and workable for a longer period of time. Blending medium can be used in a number of different ways. For maximum blending time, mix the medium directly with the water colour. Alternatively you can apply the medium directly to the paper in preparation for the water colour. Dilution with water will provide a variety of blending/ drying times. Drying rates will vary and depend on the temperature and air flow. Any initial beading of colours will disperse as blending continues. 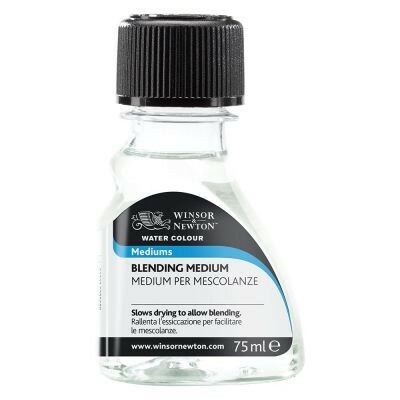 Once dry, further washes can be applied over any washes which include blending medium.